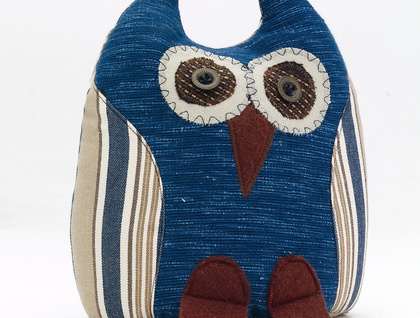 Moreporks are made from surplus upholstery fabric and filled with clean dry sand. They seek employment in fun-loving homes. They are compatible with other pets and require no special treatments, remuneration or food.Quiet in nature they make no sounds audible by humans, making them ideal house pets. Striped Peter is made from Upholstry grade fabric with a woven in stripe design. The colours in range from denim blue/navy, beige and chocolate brown. His front is made from Navy Blue that matches the stripe exactly. He has a chocolate beak and Chocolate feet,and his eyes are made from retro buttons Whooo loves Peter?